After the Archives moved to the University of Melbourne Archives, where the substantial amount material has been appropriately housed in temperature controlled conditions ever since, the VWLLFA collective members have continued to work on the material. The Collective still takes its custodial role seriously and has not only helped to maintain the collection but has also applied for and received several grants over these past number of years. Three grants from the Community Heritage Grants Scheme in Canberra over a four year period (2000, 2001 and 2003) enabled us, first of all, to have the collection assessed by The Ian Potter Art Conservation Centre. Their findings were written up in a report, Conservation and Survey Management Plan 2001, which showed that the collection was worthy of being preserved and gave recommendations about what work needed to be done to protect and maintain the various items. With the second grant we were able to buy a map drawer to store most of our many hundreds of posters. And the third grant allowed us to purchase acid-free storage materials, like large boxes for memorabilia, plastic storage bags for the posters and tissue paper for the banners and teeshirts. 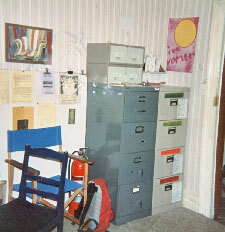 The collective received a grant in 2001 from Lesbians Inc (LINC) in Sydney to add to, but by no means finish, the detailed listings of the collection during 2002. We successfully applied for a grant from the National Fountation of Australian Women (NFAW) in Canberra in 2003, to write up the short biographies of the activists who have donated material as well as the herstorical details of the defunct collectives in the collection. 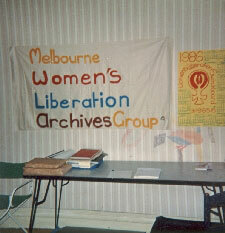 We received a small grant from ALSO / AUSSIE in 2005 to bind some of the precious Women’s Liberation, Lesbian and Feminist Socialist newsletters, newspapers, magazines and journals with distinctive purple covers. Most recently, we were able to set up this website with another grant from LINC (2007). Of course, applying for and getting the money was one thing, putting it to practical use quite another. Since the beginning of 2001, members of the collective have not only been meeting on a regular basis but they have been doing volunteer work on a regular one day a week basis at UMA to do whatever’s necessary to maintain and preserve this unique collection. The typing up of the bios so that we now have a substantial biographical listing of most of the activists from the 1970s in particular, who they were and what they did, and the background details of the collectives that were active back then. These bios have been placed in the appropriate boxes of all the individual donors and collectives as a record. (If anyone who donated material hasn’t sent in their bio as yet this is your reminder to do so). All the photos have been put into approximately 15 or so acid-free photo albums. This is not a comprehensive collection as most activists are understandably still holding onto their personal photos but it’s a start. Before storing all the badges according to provenance in albums, we sorted them into related issues, which means we have a collection that probably reflects most of the issues and actions of the early WLM years in particular, including many of the ones made on badge-making machines as fundraisers. The teeshirts and the textile memorabilia, like a clown costume from the Performing Older Women’s Circus and items from the Cockburn Sound Action in WA in 1984, were photographed front and back before being stored flat between acid-free tissue paper in acid-free boxes. Again these are an invaluabe record of the many gatherings, performances, demos and conferences feminists and lesbians participated in. To photograph all the approximately eighty large banners for documentation purposes before they were rolled up, the photographer had to stand on a ladder and the banners had to be taped to the railings of a staircase and even them some of them were so large they had to be photographed in two pieces. The banners were then laid flat on a very long table in the front room of UMA before being very carefully rolled one at a time onto PVC pipe to hold them stable and at the same time wrapped in very long pieces of acid-free tissue paper. 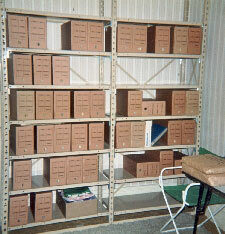 We then tied them with cotton tape, labelled them with the message and the name of the donor and took carried them out the back to store them in rows on the tops of the filing cabinets. As we put all of the hundreds of posters back-to-back into acid-free plastic bags according to size and provenance they were listed and listed before being stored flat in convenient stacks in our newly-acquired map drawer. Binding the publications, so they could be made more accessible and at the same time ensure their preservation, involved quite a bit of work beforehand. We had to gather all the copies of the different newsletters and magazines, choose the best issues, put them in order and thenmake sure there were back-up copies before sending them off to the binder. 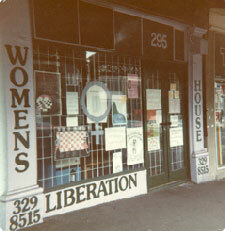 Some of these publications such as the Lesbian Newsletter (1976 - 1983), Lesbian News (1983 - 1990), Melbourne Women’s Liberation Newsletter (1972 - 1984) and Victorian Women’s Liberation Newsletter (1986 - 1994) had never been in one place in chronological order before. So that was exciting in itself. We were able to get the Lesbian Newsletter, the Lesbian News and Labrys (1990 - 1992), bound with the grant. And thanks to donations of Lesbiana from the three Editors, Sheril Berkovitch (1992 - 1995), Jan Campbell (1995 - 2000) and Jude Dennis (2000 - 2004), topped up by the odd copy in the Archives and a last minute donation, we have also been able to bind one complete set of Lesbiana as well as a set each of Vashti’s Voice / Vashti (1972 - 1981) and Scarlet Woman (1975 - 1990). We’re still in the process of storing all the rest of memorabilia, such as a pair of soccer boots from the Fairfield Falcons and the comprehensive resource file from Women’s Liberation Switchboard, as well the few videos, films and tapes in the collection into acid-free boxes. It usually took several months to do any one of these projects and while it was all extremely time-consuming the work was also immensely satisfying. So next time any of you are doing your PhD thesis on lesbian feminist activism (keeping in mind that general lesbian material can be found in the Australian Lesbian and Gay Archives) or doing research on any issue to do with the Women’s Liberation Movement from 1969 onwards or just have a general interest in any of this material for your own benefit, just remember that the VWL&LF Archives can be accessed through the Baillieu Library at Melbourne Uni.